The bills will help patients save money on prescription drugs. 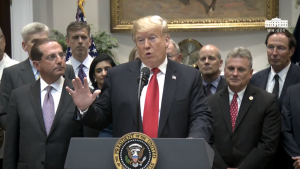 ARLINGTON, Va. – At the invitation of the White House, the National Association of Chain Drug Stores (NACDS) today participated with President Trump in the signing ceremony for the Patient Right to Know Prices Act (S. 2554) and the Know the Lowest Price Act (S. 2553). Representing NACDS at the ceremony were NACDS vice chairman Chris Lane, executive vice president, Wakefern Food Corp./ShopRite, and NACDS president and chief executive officer Steven Anderson. The bills will help patients save money on prescription drugs by ending so-called “gag clauses” that prevent pharmacists from telling patients about instances in which they could save money by paying cash out-of-pocket instead of using their insurance benefit. S. 2553 pertains to Medicare Part D and Medicare Advantage, and S. 2554 pertains to private plans. In addition, S. 2554 includes a separate NACDS-backed provision that requires the Federal Trade Commission and the Department of Justice to be notified of any biosimilars patent settlements, as a way to prevent such agreements from delaying patients’ access to lower-cost drugs. “NACDS applauds the focus and the determination that the Trump Administration is bringing to the work of reducing patients’ out-of-pocket drug costs, and we appreciate the diligence of these bills’ Congressional sponsors in leading this legislation all the way to the President’s desk,” Anderson said. Sen. Susan M. Collins (R, Maine) is the lead sponsor of S. 2554 and an original co-sponsor of S. 2553. Sen. Debbie Stabenow (D, Mich.) is the lead sponor of S. 2553 and an original co-sponsor of S. 2554. Serving as original co-sponsors of both bills are: Sen. John Barrasso (R, Wyo. ), Sen. Bill Cassidy (R, La. ), and Sen. Claire McCaskill (D, Mont.). In addition, Sen. Ron Wyden (D, Ore,) is an original cosponsor of S. 2553. In the U.S. House of Representatives, Rep. Buddy Carter (R, Ga.) introduced the Know the Cost Act (H.R. 6733), which applies to both Medicare and private insurance. The U.S. House of Representatives Committee on Energy and Commerce passed that legislation on September 13. The House ultimately passed the Senate legislation on September 25 to fulfill the requirement that both chambers must pass a bill in identical form for it to be signed into law by the President. NACDS’ engagement on drug-pricing issues is a key aspect of the NACDS “Access Agenda.” The Access Agenda platform is rooted in the concept that just as pharmacies provide access to better healthcare every day, they also stand ready to provide access to health policy solutions that are rooted in experiences on the front lines of care.